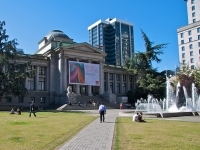 Established in 1931, the Vancouver Art Gallery boasts thousands of national and international exhibitions by a range of artists, sculptors, and photographers, housed in a turn-of-the-century heritage building in the centre of downtown Vancouver. The building also houses a cafe and shop. National and international touring exhibitions take place regularly at the gallery, with works from Picasso, Rodin, Andy Warhol, and others. Whether you prefer the Old Masters or more contemporary artists, the Vancouver Art Gallery is well worth paying a visit. Check out the official website listed below for details on current temporary exhibitions. Opening times: Open daily, from 10am to 5pm (until 9pm on Tuesdays). Admission: C$24 (adults), C$6.50 (children over five), free for children under five. Other concessions are available.